Moshi’s owner from New York, Stephanie Riggio, has had much success through the years in the Amateur Adult and Amateur-Owner Hunter rings all over the country on her various horses. Riggio will aim to make a successful partnership with Moshi, like she has done with her other mounts. “When they think he’s ready, Stephanie will be on, and we’ll be cheering them on in the Amateur-Owner Hunters,” stated Ferrell about when Riggio will begin showing Moshi. The reserve championship honor in the Green Conformation Hunters went to Banderas, a seven-year-old Oldenburg gelding by Balou Du Rouet. Thomas Serio rode Banderas, who is owned by the Friday’s Farm. The pair secured the reserve championship by placing second in the model, third in the under saddle, and receiving two firsts, a second, and two thirds in the division’s remaining over fences classes. Tomorrow, the third day of competition during week eight of the 2011 Winter Equestrian Festival, will award the winner of the Ariat Adult Medal among the many other honors to be awarded. 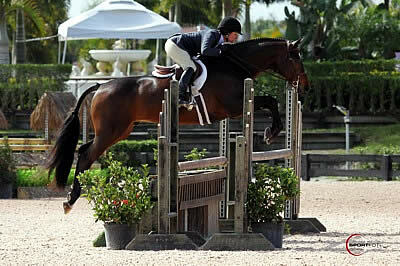 Stay tuned for more coverage of the hunter and equitation rings at the Palm Beach International Equestrian Center.